An adventurous, contemporary take on the classic end table, this extravagant piece makes the perfect addition to any hallway, den, or study. 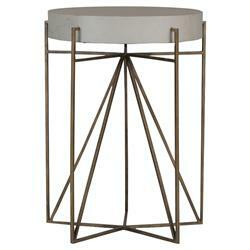 The unique design features bold, geometric lines of antique brass sprouting out from the center of the tabletop to form a sort of modern teepee. Finished in cream vellum, the drum-like tabletop brings a brightness to the piece and draws the eye upward to whatever is resting upon it.